Now that the holiday season is over, I'm looking to return to my normal diet. No more snacking on sugary sweet treats and eating until I'm stuffed. During this transition phase, I like to mix things up a bit so I'm not bored with my food or feeling deprived. I normally eat granola for breakfast, but have learned that a smoothie is a great way break out of my routine. A while back I found this recipe and it is usually my go-to when I'm craving a smoothie. 1. Place 1/2 cup water and the cashews in a blender. 2. Cover and refrigerate until the cashews have softened, at least six hours (and up to overnight). 3. Add the ice, banana, and maple syrup to the cashew/water mixture and blend until smooth and frothy. *If you are trying to lose weight, don't be scared by the fat content of the cashews. It is considered "good fat" and according to Health Diaries, research has shown that people who eat nuts twice a week are much less likely to gain weight than those who rarely eat nuts. I find that this smoothie starts my day out right and leaves me feeling satisfied until lunchtime. For me, if I begin the day with a healthy breakfast choice, I am more likely to choose healthy options all day long. This smoothie really helps me start the day off on the right foot! This sounds like such a healthy, delicious way to start the day (or anytime really). 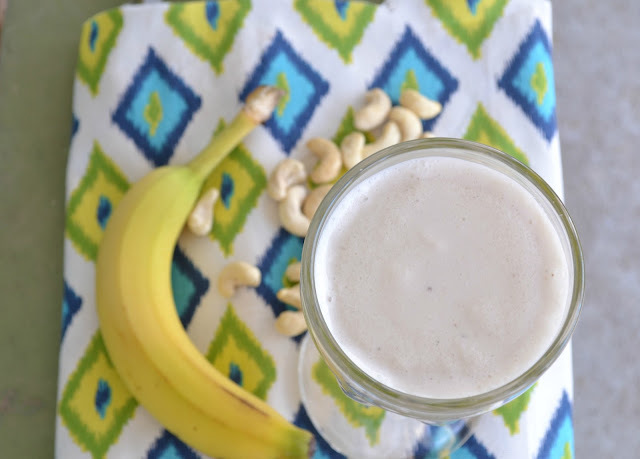 I love cashews and I've never even thought to put them into a smoothie before. I do a similar smoothie every afternoon. The banana in it takes care of my sweet tooth. That looks mighty good! What a great way to start your day! No bananas for me - not even in a smoothie! I JUST bought myself a blender, so yes, please! Sounds delicious! I either have homemade granola or a green smoothie (wheat grass, banana, apple & blueberries)for breakfast every day. Smoothies are also great in the afternoon after a workout! Awesome! I am doing smoothies and juicing right now. I am excited for new recipes! That sounds like a great smoothie Tammy. I have gone back to giving up all sugar and flour. Just a few treats over the holidays reminds me of why it tears my stomach up! Have a blessed 2013! Interesting! I have never used nuts in my smoothies, but it does sound delicious. Recently I have been seeing a lot of recipes for sauces using raw cashews, I haven't done it myself yet, but am thinking that I might need to try them sometime soon! Oh it sounds wonderful and so healthy ! That sounds interesting...we do smoothies all the time...but it has been too cold to want one lately. I freeze my bananas so I don't have to use ice...and put some yogurt in too. Happy New Year!! Tammy, how good of you to start back to normal so quickly! Proud of you. I haven't started yet and I must! Igot a gift of an Alaskan cruise in July, so I really must start working on my weight. I do like the addition of the cashews! That sounds delicious! I am going to try it for an easy breakfast for my crew one day this week. Thanks for the recipe! I'm ready to visit the vegetable isle of my natural foods market! 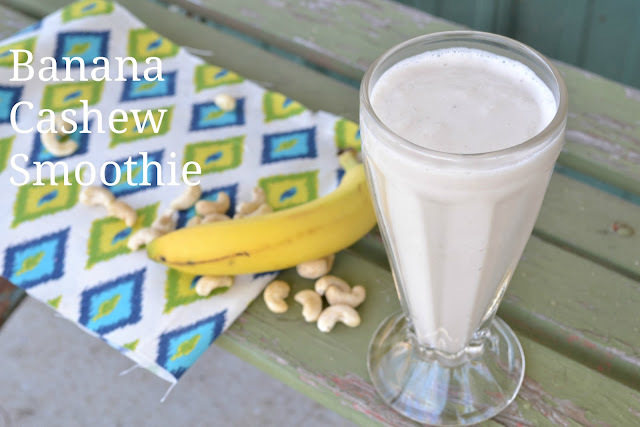 Great smoothie recipe ~ cashews and bananas may help curb my desire for sweets post holidays;) It DOES feel great to get back on track. I am making a slower transition than I'd planned (partially because my company didn't leave until today) but I did pull my juicer out this morning and it felt wonderful to have something healthy. Yum, this looks fantastic! I also need some new inspiring recipes to kick start the year! What a great place to start! I've never had a smoothie, but if I were to, this would be the one I'd try! I'm having the smoothie for breakfast this morning. It's yummy! I substuted half the water with cranberry juice. Thanks for the recipe.